This is the camp from a distance. 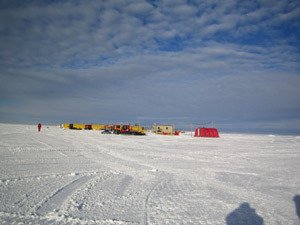 The red building houses the generator that makes the electricity used by the camp. The beige building is where Dave Anderson, the camp mechanic, worked and lived. You can see lots of big equipment parked out in front. It was great to have a mechanic. He was very helpful to the team when we were there. You can read more about Dave at Interesting People. This is the sign in front of the galley building. There are always snacks available in the galley - candy, chips, crackers and drinks. A lot of people go there just to rest or read. Of course this is where the kitchen is and where we go for meals. Captain Cook, the penguin, joined us for this photo. 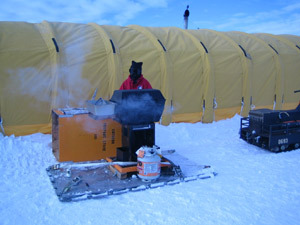 Here you can see the side of the galley tent behind our chef, Flora Deacon, who is grilling our dinner on a barbeque grill. Now isn't that something? We had a couple of meals that were barbequed. I'm not sure I would stand outside in the cold grilling chicken for 48 people, but she was nice enough to do it. And it certainly tasted good! 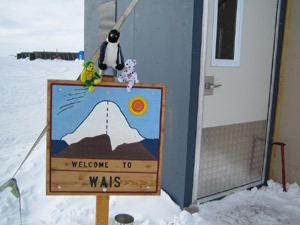 Flora was one of three chefs at WAIS. The other two were Karen and Silver. If you want to learn more about Flora and Karen, you can read their stories at Interesting People. This is the residential building where we slept. It was really bright the day I took this photo, so I didn't get the best photo. There are two doors at the front, so if it is snowing you can close one before opening the other one. That way the snow doesn't blow right into the building. These are shaped like steel "Quonset huts" that you might have seen in a town near you, but these are called "Frame Type Maintenance Tents". They were made for the army and have plywood floors. The walls are wooden beams that are held together with rope. Then the insulated cover is snapped on and tied on over the beams. 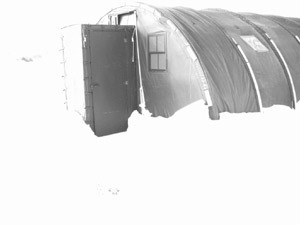 Sometimes a little snow would blow in through the gaps near the doors and windows and between the bottom of the canvas and the floor. To the left is the fuel bladder. 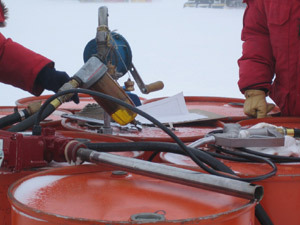 The fuel bladder is where aviation fuel (for the planes) is stored. You can also see the runway and one of the planes that landed. This plane is called a Hercules and it has skis for landing. 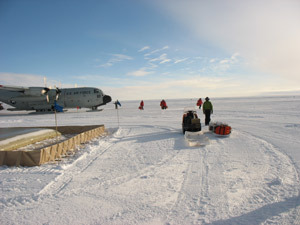 The runway is a section of the ice sheet that has been cleaned off to make it smooth. These are the outhouses (toilets). These were fairly close to our science tent. They usually didn't smell too bad because the stuff froze pretty quick in the cold weather. They were made by melting holes in the ice and then moving the building over them. This picture was taken after they had just moved the outhouses over some new pits. This is the gas station. 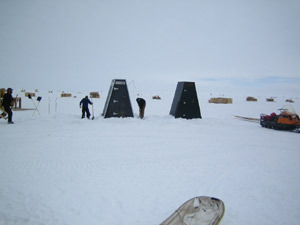 It is where you came to fill up the snowmobiles or any other vehicles you used. There were different stations for different types of fuel such as diesel, premix and gasoline. They were quite a distance away from the camp for safety reasons. You pumped gas by turning a handle. Every day we pumped until we had 120 gallons in the Pisten Bully. That was a lot of hand pumping.